Here we go. I'm ready for school. Game plan: finish DragCore, talk with the deans, finish this semester, complete summer school, skip fall semester, complete my next game, start making my platformer by fall, go back to school spring 2015. I'm kind of dreading my meeting with the dean now that the Alumni talked me out of it. It basically comes down to me having a strong passion and work ethic that other students don't have. No amount of curriculum changes will fix that, but I can at least try to talk my school into replacing some classes with open electives and marketing courses. I also have to consider starting a game development club when I return from my hiatus next spring. That's the best way I can see helping students get motivated to do portfolio work and help each other make games to get hands on experience. It's going to be a very busy year, so it's a good thing I'm ready for it. 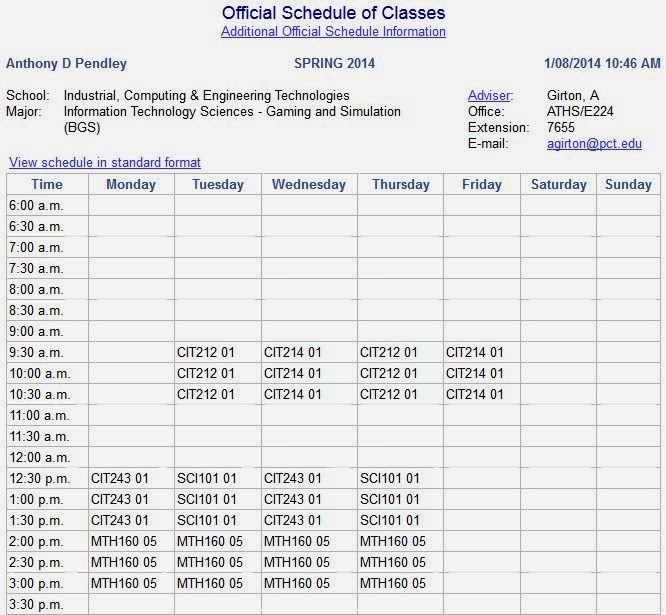 Take a look at my class schedule if you're curious after the break. This is the best schedule I've had so far. I have two classes directly related to game development with my favorite teacher and 3 classes I don't like that all end at the same time. I have Monday mornings and Friday afternoons off too, which is a great time to knockout any projects or in Monday's case, sleep in after a crazy weekend. There is even a nice section of free time between classes for me to eat lunch and get rid of some homework. This semester is going to be a breeze. I'm glad all my classes are over by 3pm. It gives me time to get all my school stuff out of the way before 6pm, giving me at least 4 solid hours of work each day to finish my games. My goal is 30 hours of game development a week at a minimum. At that rate I can get a lot of things done this semester. I'm also putting my plan to work. I refuse to buy textbooks this time. Money is extremely tight right now and we barely ever use the things in class. It's a waste of hundreds of dollars I don't have. eBook rentals should NOT cost that much. It's insane! Somehow my roommates get away with sharing books and finding free PDFs online so I'm going with them for now. It feels good to be back though. Home with friends. Having tons of people to talk to and laughing everyday. I missed this stuff... I'm going to finish strong this year. Then I'll be that much closer to my goal of being a successful game developer.